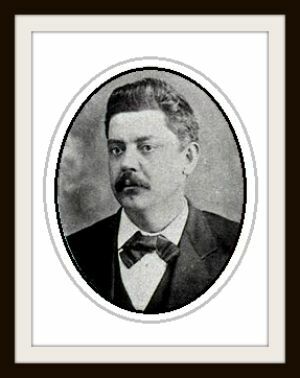 Candidate for Governor of Texas in 1898. 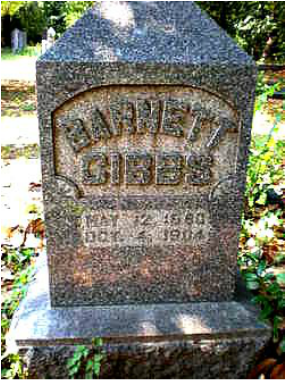 Barnett Gibbs is the son of Judge D.D. Gibbs and Mrs. Sallie Dorsey Gibbs of Mississippi. He is a grandson of General George W Gibbs of Tennessee, was born in Yazoo City, Mississippi May 19 1851. He was educated at Spring Hill College Mobile Alabama and at the University of Virginia. He received his professional education at the Law School of Lebanon Tennessee. He immigrated to Texas in 1873 and located in Dallas. Colonel Gibbs is essentially a self made man both his fortune and eminent position were acquired by his own unaided exertions, the former by the exercise of a remarkable business sagacity. He came to Texas a young man without means or prestige of influential friends and with nothing but his profession, a strong constitution, a clear head and an indomitable ambition to rise in the world and today he has $350,000 invested in real estate stocks etc. and there is no man in Texas not even considering his comparative youth who is better known and respected in social business and political circles. It will be seen from the date of his birth that Mr. Gibbs is too young to have participated in the memorable struggle of 1861-65. His father however died in the Confederate army and his brother lost a leg. 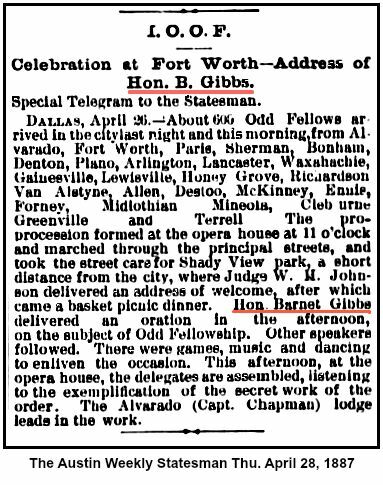 The citizens of Dallas early showed their appreciation of Mr. Gibbs legal talent by electing him city attorney. This position he held six years. He was then elected to the State Senate from which position he was advanced by the popular will to the exalted and honorable position of Lieutenant Governor of the State. This office he filled during the incumbency of the gubernatorial chair by Hon John Ireland from 1882 to 1886. During the absence of Governor Ireland it often became necessary for the Lieutenant Governor to assume the reins of government and as acting Governor of Texas he acquitted himself with great credit evincing remarkable qualities as a statesman and politician. Colonel Gibbs is the youngest Lieutenant Governor Texas ever had the youngest acting Governor the youngest Senator and represented the largest Senatorial District in the State. It is unnecessary to say that he is a staunch Democrat and the above record furnishes an indication of the very active part he has played in the political history of the State. His friends recognizing in him the requisite qualities to represent the great State of Texas with credit and ability brought him out for Congress and he made the race before the Convention with Colonel Wellborn for the lower house. 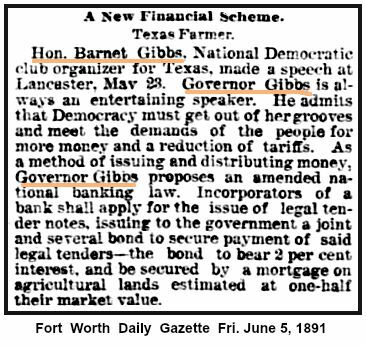 The contest resulted in locking the Convention and as usual a compromise was effected by bringing in the traditional dark horse named by Gibbs and he withdrew in Mr. Abbott's favor. 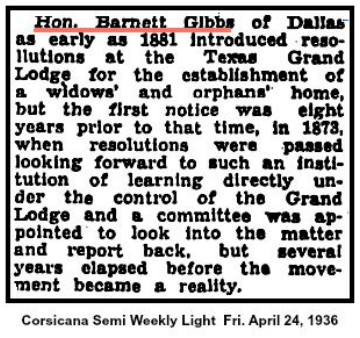 The active part Mr. Gibbs took in the memorable canvass known as the prohibition campaign is a part of the history of Texas. He was incessant in his effort to defeat the measure and the laying of that spectre was in a large measure due to his powerful influence. 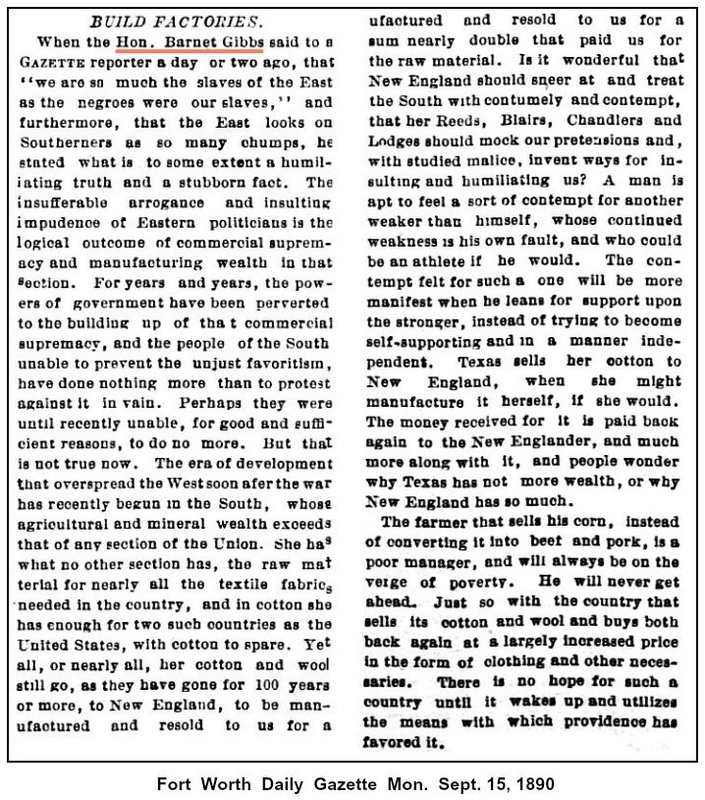 Mr. Gibbs having shown himself to be so public spirited and so keenly alive to the interests of his adopted State it is quite natural that he should have taken an active part in the gigantic scheme of securing a suitable harbor on the coast of Texas. Indeed he was the prime mover and was largely instrumental in bringing about the several conventions known as Deep Water Conventions at Fort Worth. Denver and Topeka Colonel Gibbs is an eminent Odd Fellow being Past Grand Master of the Order in Texas. His wife was Miss Sallie Haynes a daughter of the late J.W. Haynes. They have two children living Sallie and Willie. In personal appearance Mr. Gibbs is no ordinary man, large fine looking dignified and of commanding presence, he would be observed in any assembly of men. He is rather blunt in his manners especially to strangers but among friends genial companionable and of a convivial turn. He is six feet one inch in height and weighs 220 pounds, has large dark eyes of great depth surmounted by a heavy brow and shock of coarse jet black hair dark complexion and features indicative of character and great strength of purpose. Should he continue to give his attention to political matters a brilliant future awaits him. He is the idol of his friends and the terror of his enemies. Located at Oakland Cemetery in Dallas, Texas.